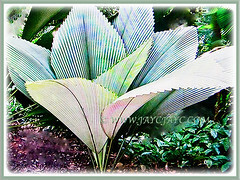 Silver Joey or Umbrella Palm is an exotic and very rare palm. It has magnificent foliage that will definitely be swooned over by palm lovers and gardeners. 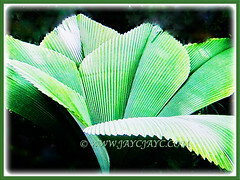 Its silvery leaves are beautifully shaped like diamonds and have wonderful parallel venations. It has become an endangered species due to destructive logging, as well as illegal and uncontrolled seed harvesting. It is currently listed as threatened and endangered in the IUCN Red List, 1997. Botanical Name: Johannesteijsmannia magnifica (syn. : Teysmannnia). 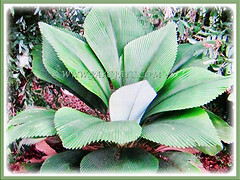 Common Names: Silver Joey, Umbrella Palm, Daun Payung in Malay. Etymology: The genus Johannesteijsmannia, is in honour of Johannes Elias Teijsmann, a Dutch botanist (1808-1882). 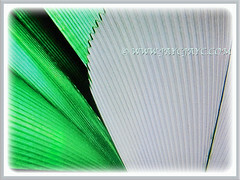 The specific epithet magnifica, is derived from Latin word magnificus, meaning magnificent or splendid, referring to its obvious attractive form and leaf fronds. Origin: Native to rainforests in Peninsular Malaysia. It is also cultivated elsewhere around the globe. 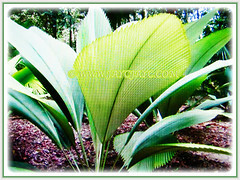 Plant type: An ornamental foliage and perennial palm. Features: Johannesteijsmannia magnifica is from the genus, Johannesteijsmannia that consists of about 4 species of palms. They are solitary fan palms, growing without a trunk. With a slow growth rate, this very hardy palm can reach up to 4-5 m in height. 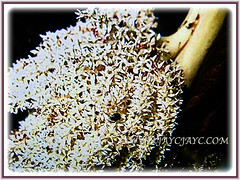 It has a single underground, prostrate stem, up to 15 cm in diameter, with leaves that appear to emerge from the soil. Leaves are simple, broadly diamond shape, with jagged leaf margins on the upper half and with distinct parallel venation. 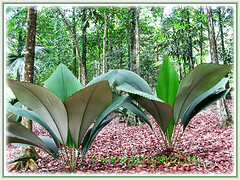 The leaves are leathery, erect and enormous, up to 3 m long and 2 m wide. The upper surface of the leaves is of intense green while the undersurface are covered with white hairs, giving them a silvery or grey colour. 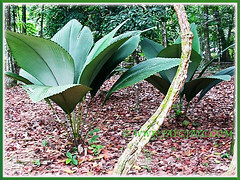 The captivating foliage are borne on a 1-2 m long petioles with two conspicuous yellow stripes on the sides, and are coarsely toothed along the edge. It produces bisexual flowers once a year and usually occurring after a period of drought. The scented and creamy white flowers are small and are borne on a low and short inflorescence which comes out between the leaves on a curved tomentose, 50-80 cm long peduncle. Its fruits are round, about 4 cm across, ripening brown in colour and indehiscent. Culture (Care): Johannesteijsmannia magnifica or Silver Joey grows easily with least maintenance. Light: Semi-shade to full shade. Moisture: Moderate water needs. It required constant humidity. Soil: Best in humus-enriched, loamy and well-drained soils. It dislikes root disturbance, thus be very careful when potting up or out. Keep the palm sheltered from the wind that would cause damage to the big leaves. Remove faded and withered leaves to keep it aesthetically pleasing. Feed once monthly with a balanced fertilizer for foliage plants. Generally free from serious pests and disease problems. For subtropical and temperate regions: Hardiness: USDA Zone 9b-11. Johannesteijsmannia magnifica or Silver Joey requires a tropical or subtropical climate, where it can resist to exceptional and extremely short-lasting drops of temperature of some degrees under the +10°C. Maintain temperatures not under the +16°C. It needs high temperatures, ambient and constant humidity. 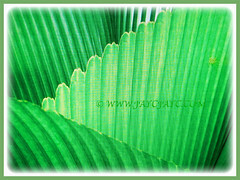 Provide a semi-shaded to shaded position and protect the palm from the winds that would cause damage to the big leaves. Young specimens are of great ornamental effect when cultivated in pot for the decoration of greenhouses, winter gardens and wide interiors. The leaves are utilized by the local populations as roof for huts and makeshift shelters. Propagation: Easily propagated by seeds. Usage: Johannesteijsmannia magnifica or Silver Joey is excellent for growing in parks under shaded areas for its beautiful form and attractive diamond shaped leaves. 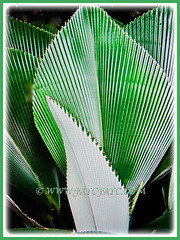 Its ornamental foliage and ornamental form will be most suited for any tropical garden. Natives frequently use the leaves for thatching the roofs and ceilings of dwellings.